Andy Puddicombe, a former Buddhist monk, the Voice of Headspace, and the UK’s foremost mindfulness expert, is on a mission: to get people to take 10 minutes out of their day to sit in the here and now. Like his readers and students, Andy began his own meditation practice as a normal, busy person with everyday concerns, and he has since designed a program of mindfulness and guided meditation that fits neatly into a jam-packed daily routine―proving that just 10 minutes a day can make a world of difference. Accessible and portable, The Headspace Guide to Meditation and Mindfulness offers simple but powerful meditation techniques that positively impact every area of physical and mental health: from productivity and focus, to stress and anxiety relief, sleep, weight-loss, personal relationships…the benefits are limitless. The result? More headspace, less stress. Andy brings this ancient practice into the modern world, tailor made for the most time starved among us. 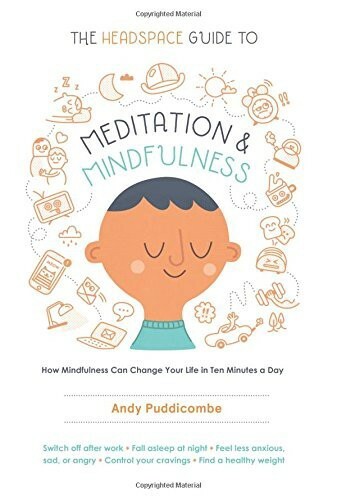 ANDY PUDDICOMBE is currently the only Clinical Meditation Consultant in the United Kingdom with Medical Advisory Committee clearance for private practice. As a former Buddhist monk, he has trained extensively in meditation all over the world for more than 15 years and has been acknowledged as one of the UK’s foremost mindfulness experts. He is the author of three Headscape Guides (The Headspace Guide to Meditation and Mindfulness; The Headspace Diet; The Headspace Guide to a Mindful Pregnancy) which are now available in 25 countries and 10 languages, and has been featured widely including in Vogue, the New York Times, Financial Times, Entrepreneur, Men’s Health, and Esquire. He also makes regular appearances on TV and online, having been featured on BBC, Netflix and TED. Andy currently lives in Venice, California with his wife and son.